Do you like Anna and Elsa Halloween Night? Share it with your friends. 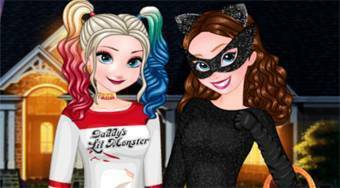 The Halloween celebration is at the door, and the sister Anna and Elsa are also preparing for this anticipated event in the fabulous girl game. Your task will be to choose both original costume, hairstyle and fashion accessories for both girls. Following will be a selection of interesting makeup and finally take care of the decoration of their home and garden.